Salvador Dali’s painting Corpus Hypercubus (1954) is a fascinating visual representation of a mathematical metaphor for the theological mystery of crucifixion. Many people are familiar with how to unfold a cube from three dimensions into two as shown in the figures below. Some of the edges of the cube are separated so that the resulting collection of squares can be unfolded into a planar shape. The resulting diagram is called a “net” for the cube. The net is not unique but one common net resembles a cross. 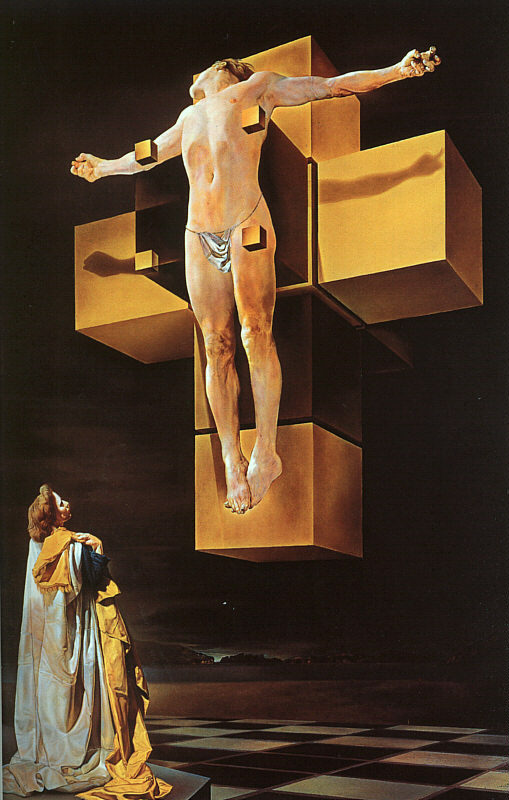 Dali painted the cross in Corpus Hypercubus as a hypercube unfolded into 3-dimensional space. The hypercube consists of eight three-dimensional cubes for hyperfaces. Each hyperface is attached along a two-dimensional square face to six of the other hyperfaces. Just as one can unfold a cube, one can also unfold a hypercube into the shape depicted in Dali’s painting. Using the analogy of a (mysterious) higher-dimensional object unfolded into three dimensions, Dali depicts the theological mystery of the crucifixion as an event that originated in a higher plane of existence and then unfolded into the world that we perceive. With this understanding, Corpus Hypercubus communicates the idea that though one can discuss the necessity of the Jesus’ sacrifice for salvation or study theological ramifications of the cross, one can only do so by analogy because human nature simply cannot perceive the scope of God’s plan.